We booked this tour about 45 days prior to Oktoberfest, and felt it was the only way to secure a table at a major tent. We found out other ways while there - but this was worth the money to avoid those hassles. Jay was our tour guide and he was great! The short Munich tour was very informative and a nice prelude to the actual Oktoberfest. We met some very fun people and were able to enjoy drinking beer with them all afternoon. Absolutely amazing tour. Jay was fantastic and a very nice tour. He showed us the history of downtown Munich, and then took us into the beer hall, and we had a nice reserved table. 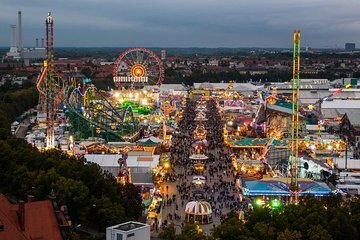 We enjoyed meeting the other super friendly people in our group, and would recommend this tour to anyone interested in a smooth Oktoberfest experience. Well organized. Tom has a wealth of knowledge about Munich and about the Oktoberfest. We are so happy that we booked with them. Totally recommend this company to get you there - safe, happy and drunk. My husband - the beer drinker - and I loved it ! Jay our tour guide was fantastic and knowledgeable. An ex pat from Houston. Hold on to this gem of a guide. It was a wonderful day with a great group and guide. We had a wonderful tour guide, Jay. He was so informative and had great stories to share. Would definitely recommend to anyone interested in learning about the history of Munich and the Oktoberfest is a Must ! My wife and I absolutely LOVED this experience. We highly recommend it if you enjoy hearing about history, drinking beer and eating chicken!! Tudo que foi prometido foi cumprido! Pessoal muito profissional e a Oktoberfest é demais. Valeu! It was so fun meeting new people. Our tour guide was knowledgeable and it was a great way to see bits and pieces of Munich. Getting a table this way inside one of the large tents was worth the money. The entertainment value of people watching was great. Bonding over beer, what could possibly be better? Tid bit of advice, the chicken is a lot of food. If you go with a group, have one person get the chicken, and have someone get another dish. I met 3 halarious girls and 2 fantastic couples. Only the guys managed to finish the 1/2 chicken. This tour was good but not on par with other Viator excursions I have taken. My sister and her husband accompanied us. I had been telling them about how great my past Viator tours had been. Frankly, I was a little embarrassed after we took this tour. Excellent! Our group consisted of 10 people plus our guide. We walked Munich and then went to Oktoberfest. Our guide, Bridget, was great! When we arrived at our Oktoberfest the ten people in our group, even though we just met, had a grand time. We were involved participants of Oktoberfest! Fun!